As a parent, they have a sole mission and job to provide the safest environment possible for their children. 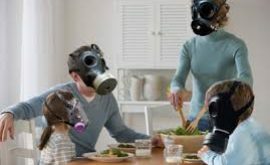 For many parents keeping their little humans as close to them as they can is what they believe to be the safest place for their child, but what if that solid home environment that you think is the safest place in the world for your baby really hides potentially dangerous looming toxins that can impact your child’s health? The EPA recently has brought the concern of indoor air quality to the forefront as they concluded that indoor air is 2 to 5 times more polluted than outdoor air. Thus, leading to the question, ‘Is your home a safe environment for your child?’. Are Children More Vulnerable to Air Pollution? 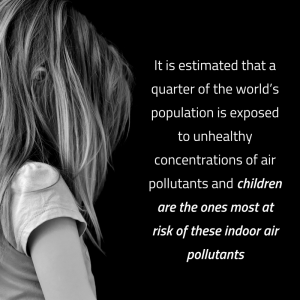 It is estimated that a quarter of the world’s population is exposed to unhealthy concentrations of air pollutants and children are the ones most at risk of these indoor air pollutants, specifically because their organ systems are still developing and have not reached full maturity. This makes children’s organ systems weaker and more susceptible to potential health risks. Furthermore, children require more oxygen relative to their body weight than adults, thus the increase in air intake leaves them at an increased risk of breathing in contaminated air that has been polluted by different sources of pollution. Some sources of pollution could include oil, gas, tobacco products, building materials, and chemicals found in the indoor air. In a study conducted in Nanchang, China, parents found that air pollution had a significant impact on their children’s respiratory health. The top three respiratory conditions associated with poor air quality among children was coughing, upper respiratory infections, and bronchitis. These can be significantly impactful to the health of a child and could potentially lead to further health problems down the road for your child. You may be wondering, “what are the most common sources of pollution that impact the air quality”? Some of the major attributing pollutants that affect children the most can include vehicle emissions, secondhand smoking, and dust. However, when we are talking about the major players that could pollute your home’s air this can include a completely different list of pollutants. Making an effort to improve indoor air quality, especially for the overall benefit of your children can be essential in ensuring a safe, non-toxic environment for your child and their health. While it’s not feasible to eliminate all sources of pollution in your home, there are several changes you can make to reduce the level of pollution and make your home safe for your child. Here are four easy steps to implement in your home to reduce air pollution and improve indoor air quality for your child’s health. A clean house can sometimes mean a healthier house. Ultimately good indoor hygiene can greatly cut down on pollutants like allergens (dust, pet dander, etc.) in your home. When cleaning your home, you want to go through the basic cleaning processes such as dusting, vacuuming, and washing linens that have accumulated a build-up of either pet dander or dust mites that have developed on the surface of these items. This is especially important when you have a little crawler on your hands that is always on the move (I’m sure you know what I mean- your kids go everywhere, even places their not supposed to! ), you want to make sure that all the surfaces that are available to your child is clean and free of pollutants that can impact their health. You may not have ever considered this, but the products you use to clean your home could be expelling harsh toxins into your environment and impacting your child’s safe environment. Household cleaners can be harsh on your children and affect their eyes, airways, skin, and even more. Cleaners with toxic ingredients don’t only kill germs and get out tough stains but can also affect the health of your child in a number of ways. Cleaning products can release volatile organic compounds at levels up to 100 times higher than found outdoors. Air fresheners, multi-purpose cleaners, candles, dish soap, glass spray, and wood cleaners can all be culprits of VOC emission in your home. Like we mentioned above, children are more at risk of ingesting these pollutants in the air because of the increase in air intake that children obtain. Also, something else to consider is the risk of your child developing asthma as a result of toxic cleaning chemicals and VOCs emitted by these cleaning products. One of the leading health effects caused by toxic cleaning products used in your home is the development of asthma in your child. Asthma in children has increased as the level of pollutants in the environment could be impacting this significantly, with nearly 1 in 10 children suffering from asthma in the United States. It has even been said that the use of four or more household cleaners in one home can increase the incidence of asthma in children. Scary, right? Well, there is hope and a solution! Simply look for environmentally friendly, non-toxic products that won’t release harsh toxins and chemicals into your home’s air and leave the toxic cleaning products in the trash! Filtering out polluted air trapped in your home can be a difficult task, especially with the lack of ventilation present in most new homes. Having air filtration in your home is an essential method to getting your air clean and eliminating pollutants trapped in your air quality. With the EnviroKlenz Mobile System, you can remove a broad spectrum of chemicals, odors, and fragrances, as well as remove fine particulate matter collected in your air flow. 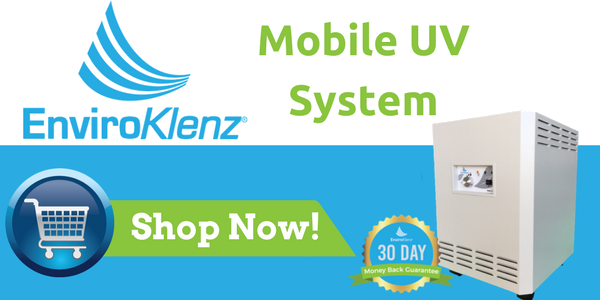 The EnviroKlenz Mobile UV Air System has a true certified HEPA filter with the added protection of Ultraviolet Germicidal Radiation (UVC lights) for microorganism kill (bacteria, viruses, and mold spores). In addition, the EnviroKlenz earth mineral technology breaks down chemicals into their elemental parts so they are gone forever. It captures, destroys and neutralizes toxic chemicals and hazardous VOCs, odors, and fragrances. 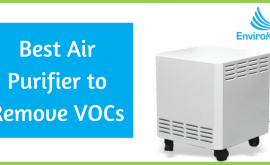 It has been validated and tested to be much more efficient than a carbon air purifier. 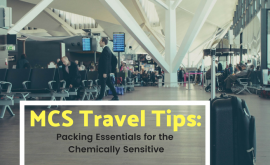 Perfect for allergies, asthma, and people with multiple chemical sensitivities (MCS). Even perfect for shielding your children from harmful chemicals and toxins trapped in your home’s air. 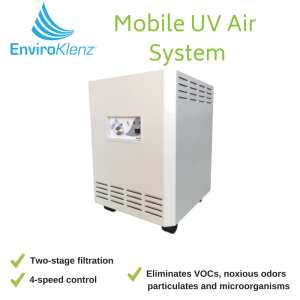 The EnviroKlenz Mobile UV System offers indoor air protection from potentially harmful mold spores that could be in your home’s air. 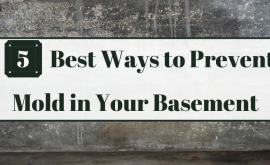 Do you have mold in your home? The EnviroKlenz UV System can help! This system utilizes Ultraviolet Germicidal Radiation (UVC lights) to trap and kill mold spores that are in your indoor air. Breathe easier with this air purification system in your home! Two-Stage Filtration, With Patented Technology & a Certified Hospital-Grade HEPA Filter for Ultimate Protection! Air Cartridge That Works to Eliminate a Broad Spectrum of Chemicals & Odors- With Up to a 6 Month Life!